Summary: The advancement in technology has led to significant changes in console construction. Console systems have significantly evolved over the past decade to accommodate all the new and exciting technologies. A much simpler and more streamlined console system is now possible because of fewer appliance and the utilization of racks to essentially hide excess components. The design process of a console system requires the company to invest a significant amount of time analyzing and understanding the customer’s needs. For instance, what is the functionality of the system? 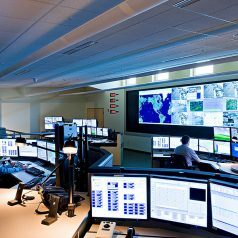 Is there an emergency operations center design that needs to be prioritized? What equipment is going to go into the console? Furniture systems need to be designed to address day-to-day operational tasks and maintain the flexibility to accommodate extra operators when it comes to a crisis situation. While technology will change in the upcoming years, consoles will usually stay in place for over a decade – and most people overlook this. Constant Technologies, Inc. an established global solutions company, integrates customized display wall solutions and technology furniture from the floor up to meet your needs and specifications. Additionally, there are other factors to consider when designing consoles – such as the human factor. The ergonomics of console design plays a crucial role in the comfort and health of the operator. The primary monitor should be placed in a relaxed position to avoid neck and eye strain. When an operator looks downwards, his or her eyelids are partially shut, avoiding dry eyes over long periods of work.